The fragrance of scented roses in the garden creates instant impact at the height of the season. If you are looking at creating a sensory garden or a romantic perfumed garden roses are a wonderful addition. Many varieties of roses are scented, however the perfume produced differs from rose to rose and intensity also differs. The fragrance is influenced by the type of rose, however the weather conditions, mainly warmth and the health of the plant will also influence fragrance. Fragrance also changes as the flower itself ages. Roses are most fragrant when they are 1/3 to 2/3 open, and this is when they are ready for pollination, rose perfume is for attracting insects, we just get to enjoy it as a side benefit. The fragrance itself also differs from rose to rose, and you may find that some are more appealing to your senses than others. So simply choosing the 'most fragrant' roses from a list is not actually a good idea if you are fussy. Its a little like selecting perfumes, some you like, some you do not. Roses fragrance is described using seven main terms. If you can imagine those scents you will understand the variations a little. You will also find other terms used to describe the fragrances, including honeysuckle, hyacinth, honey, wine, marigold, peppery, and fruity. We guide through our top ten scented roses for the garden, an interesting collection of roses all with their own beauty. How to choose a rose for scent and how to plant a rose. 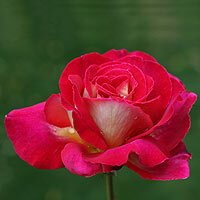 Links to rose nurseries and rose growers. Ispahan is one of the most fragrant of all roses. A heavy Damask Fragrance and a long flowering rose. A more spicy fragrance than some, long flowering and excellent double flowers as well. A strong citrus fragrance with wonderful complex yellow petals. Another with a strong scent. Nice deep pink flowers. A nice fruity scent. Pink flowers. An old rose with a distinctly Damask perfume. Scarlet blooms and great on a rose arbor. A repeat flowering rose with a sweet fragrance. A climbing fragrant rose with dark pink flowers. This is almost thornless, and vigorous as well. Roses are more fragrant in the morning than in the afternoon.